PUERTO CHIAPAS, Mexico — At least 10 yachts from the U.S. West Coast, U.S. East Coast, South America and Europe were welcomed into the new marina at Puerto Chiapas in October, according to dockmaster Enrique Laclette. However, the marina’s official “grand opening” is planned for later this month. Puerto Chiapas is the first Mexican harbor that yachts reach when arriving from Central America or the Panama Canal, and it sits at the southeastern gateway to the notoriously windy 260-mile-wide Gulf of Tehuantepec. Logistically, the new Marina Chiapas is the safest and most comfortable boating facility for northbound yachts to wait for a safe crossing of the gulf. For southbound boats, Marina Chiapas is the first place to recover from an arduous crossing — and also to refuel, provision and handle Zarpe paperwork before departing Mexico into Central American cruising waters. Laclette previously was the dockmaster at Marina Chahue at Huatulco, located at the opposite end of the Gulf of Tehuantepec. There, he earned praise from the international yachting community for accurate weather forecasts that he broadcast in English on VHF and SSB radio. The forecasts were specifically tailored for the many visiting pleasureboaters awaiting a safe weather window for crossing the blustery gulf. Cruise ships enter and dock in the northern bay of Puerto Chiapas, so if boaters wish to anchor there temporarily, it is at the discretion of the port captain. The marina’s access channel and yacht basin are dredged to a minimum depth of 15 feet at mean low water. The location provides 360-degree shelter from Tehuantepec winds. “It’s like a lake inside,” Laclette said — even while winds blow strongly outside on the Pacific Ocean. Marina Chiapas has 63 full-service floating slips on three parallel docks. 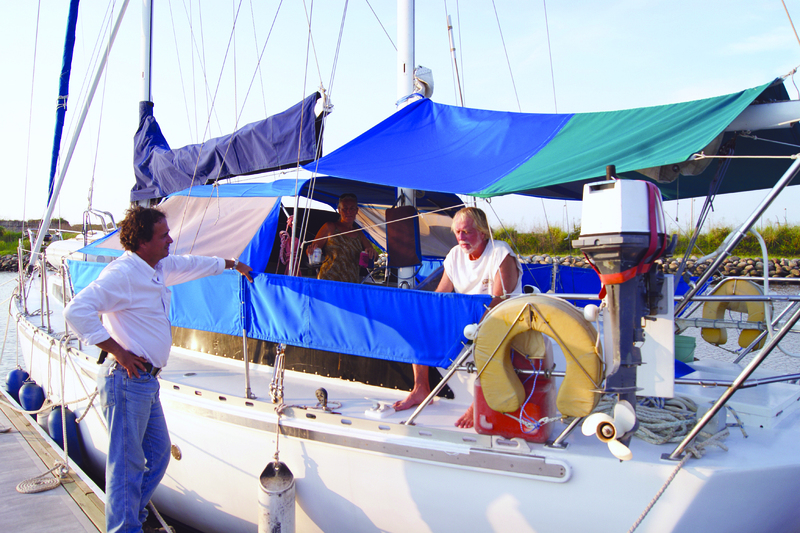 Slips range from 30 to 60 feet, including end-ties for yachts up to 80, 120 and 160 feet in length overall. All the docks have potable water, shore power (110v, 220v and 440v), Wi-Fi, dock boxes and access to the marina’s showers and laundry rooms. Guests can also use Internet services in the marina office building overlooking the slips. Marina Chiapas will handle paperwork for yachts clearing into or out of Mexico. Boaters no longer are required to find their own way to four different port-clearance offices spread around the harbor and nearby Tapachula airport in order to complete their own paperwork. “The minute you tie up to our cleats, the officials will be called to the marina and will perform all the paperwork right on your boat,” Laclette said. It usually takes about an hour, while the boaters enjoy a welcome margarita, on the marina, he added. Reservations will not be taken for slips, Laclette said, because many northbound yachts will not want to depart until weather in the Gulf of Tehuantepec is safe and comfortable. However, arrangements for taking on diesel fuel should be made in advance through the marina. Discounts for larger quantities of diesel are made through the marina office, while smaller quantities of fuel in jerry jugs are also available. Provisioning runs and cultural tours to the nearby city of Tapachula will also be offered from the marina. Tapachula is famous for its duty-free shopping zones, and it has familiar Walmart, Sam’s Club, Home Depot, Ace Hardware, Office Depot and Sears stores. Mayan ruins and historic sites are nearby, which are becoming increasingly popular as tourist attractions. “In the second phase (of construction), Marina Chiapas will have a very secure dry-storage yard for boats to 60 tons,” Laclette said. “This will be a good place for spending the summer on the hard.” The 5-acre concrete yard is already in and fenced, and the Travelift is on its way. The marina’s second phase of development will include shops (including a small chandlery and a facility for groceries and convenience store items) on the marina property, plus hotels and condominiums around the perimeter. The Casa Clubhouse for sportfishing groups is already open and running tournaments. Laclette said he plans to continue his informal weather service at Marina Chiapas, which is privately owned by a group of business owners in Tapachula. For details about this new marina, email Enrique Laclette at marinachiapas@hotmail.com.